As I was packing away the cot sheets recently, I came across a set that I love and was unsure what to do with them. Not only do I really love the fabric, they brought back a flood of happy memories, as packing away baby stuff often does. Now Lexi wrote an amazing post last week and it included her experience of mothers' groups and how it didn't work for her, and I was really sorry to read that, and comments by readers with similar experiences, because my mothers group was a much needed lifeline for me. I would have found it pretty tough without a good support team in those early motherhood days, and I was lucky to be part of a super nice group. Every week we'd meet in the park, at the pool, at someone's house or a cafe. We lived in Leichhardt, Sydney's Italian heartland and the high street was one long strip of cafes and restaurants. We'd descend on some unsuspecting cafe, with prams, nursing mothers, crying babies and all their assorted paraphernalia, 12 decaf lattes and 12 glasses of water. We'd sit for what seemed like hours, chatting, laughing, sharing, sympathizing. No topic was taboo, no question went unasked, or unanswered. I would have gone mad without our weekly get togethers. But what I remember best of all is our regular nights out. Given where we lived, we were never short of great local places to go, so we'd get out of our track suits, leave the babes with their dads and hit the town. Lot's of wine, lots of food, lots of laughs. Very happy memories. Gosh, I really miss them. Which brings me back to the sheets, one clever mama, Heidi, used to make super stylish baby stuff to sell at the local farmers market, and as I packed away these favourite sheets she made, they made me smile. They were soft and loved and filled with happy memories, not just of my babies but of good friends. What to do with them? Inspired by Angie's post about up-cycling flannel sheets into pajama pants, I got to making a pair of what I'm calling Heidi pants. Me! I Did! Today! 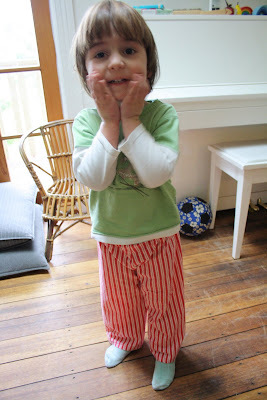 Using the instructions in Amanda's book, I actually made Hugo a much needed pair of Heidi pants (catchier name than recycled cot sheet pants don't you think?). Yeah, they're a bit wonky, but these pants are winners on so many counts. Hugo's happy with a pair of mama made Heidi pants, I'm reminded of good times when I see them and I'm pretty pleased at my first attempt at actually sewing something that my children can wear. Yeah! Definite winner! These are so lovely. They're such a nice way of prolonging baby memories! Well done. They are fantastic!They make me think of peppermint. Nice to hear the mother's group holds so many lovely memories for you. I'd love to come to yours for cake and tea. Any day. Hello - your life is my fantasy life. I am working on Matt for a change of pace. A change of place. Those pants look FAB! I love them. For everything they stand for and for the fact that you made them, they are full of lovin'! My word verification is wizatopl. i think they would be great for big people too! good grief i was just drooling at that choc cake from a few days ago....and now you're sewing too. you are too clever by half, madame, and i'm jealous! Great PJ job Michelle! They look great. I'm sure Elsa will be after a pair now. I was skeptical about Mothers groups and admittedly we were a very diverse bunch but it was a great help in those early days of mothering to know others were often facing similar issues. Love these pants. So stripey and soft. I'm pretty inspired to do the same. I am quite fond of my mums group too. We really don't have very much in common except we had a baby around the same time and live in the same area, but we are all nice to each other, and that's just what we needed. I think these are gorgeous Michelle & I reckon Mr. Hugo will remember them long after they've gone to fabric heaven. He looks very cool! Haven't been by in a while, so I've really enjoyed catching up on all your fab posts. Great name for the pants! :) Cute pants, too.